Do You Understand Infection Control Issues? If you want to better understand the significant issues involved in good infection control procedure, this 21 page report is for you. Updated May 2014 to include recent changes from the W.A. Health Department in regards to swabbing. 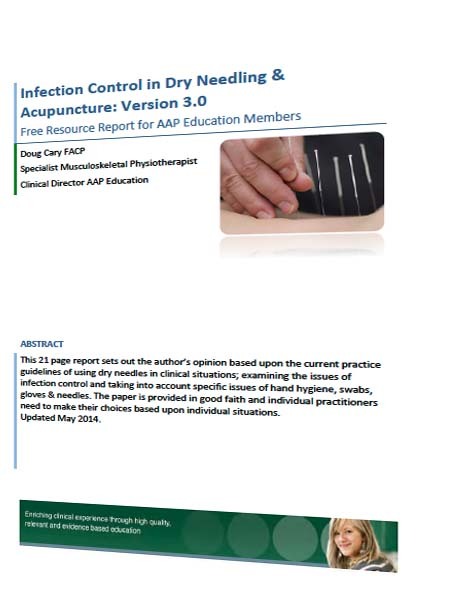 The report, titled "Infection Control in Dry Needling & Acupuncture V3.0" is a synthesis of current national infection control guidelines and how they impact on your clinical practice. You need this information to make appropriate decisions on infection control. As always, this report is provided in good faith and practitioners need to make clinical decisions based upon individual situations. Along with this report, you'll also get a complimentary subscription to our Dry Needling & Acupuncture email series. This consists of a weekely digest, direct to your email box on a topic dry needling and acupuncture related. You'll get ideas, research information, techniques, insight and inspiration on a regular basis, helping you unravel those clinical conundrums appearing every day. YES, I would like to join over 5500 health professionals in the AAP Education tribe & receive your regular updates sent to my email in-box. Of course, if you want to unsubscribe at any time, you may do so with the link at the bottom of each newsletter. Your email address is safe & will never be sold or rented to anyone else – ever! Complete your name and email details in the boxes below and I will promptly send you a copy of your free report. Success! Please check your inbox to locate your report. I believe you will find lots of detailed, quality reading in your report that will help you make informed decisions.